Sunny days spent on sandy beaches and evenings strolls through the quaint Old Town are among the joys of visiting San Sebastian. Picturesquely set on the crescent-shaped Bay of Concha, this elegant town is one of Spain's most fashionable beach resorts. The expansive shoreline extends for several kilometers along a curving coastline, bookended by the Urgull and Igeldo hills. San Sebastian delights visitors with its scenic beauty and savory cuisine, and surprises with its lively ambience and cultural attractions. Visit the royal palace and its gorgeous gardens, amble along the terraced seaside promenade that overlooks the town's inspiring architecture, and then wander atmospheric cobblestone lanes in search of authentic pintxos, the Basque version of tapas. These tantalizing small bites include specialities such as seasoned olives, grilled prawns, clams in pepper-parsley sauce, marinated sardines, and salted cod omelette. The picture-perfect white sand beach of the Bahía de la Concha (Bay of Concha) is the most iconic sight in San Sebastian. With a wide shoreline and mesmerizing turquoise waves, this expansive beach extends for more than a kilometer. The beach, known as La Perla, overlooks the cityscape of San Sebastian and has an ambience of elegance. A protected location in the bay ensures calm, gentle waters that are safe for swimming. The Perla del Océano swimming area is found on the site of the former royal bathing pavilion. Besides sunbathing and swimming, tourists will also enjoy strolling La Concha. A lovely promenade with elegant railing and street lamps, the Paseo de la Concha encircles the bay along the beach. Within walking distance of the Bay of Concha is the tree-lined Alameda del Boulevard, a hub of San Sebastián's life with many shops, restaurants, and cafés. 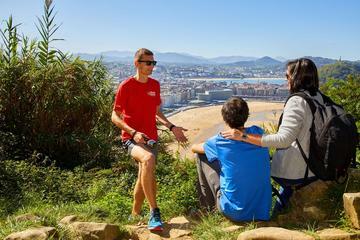 From here, tourists can explore the charming Old Town of San Sebastian. Ondarreta Beach is a lively beach that swells with holiday goers during summertime. On the Bahía de la Concha, the Playa de Ondarreta borders Monte Igueldo and the grounds of the Palacio de Miramar. This fine sandy beach is a great place for sunbathing, strolling, and playing beach volleyball, or for taking a stroll along the promenade. The 100-meter-wide shoreline extends for a kilometer, offering an impressive total surface area with plenty of space for sunbathing. During the most popular months of June, July, and August, the shore is lined with classic striped beach cabanas, lounge chairs, and sun parasols. In the winter, when the waves are up, the beach draws many bodyboarders and surfers. The Museo de San Telmo is an exceptional museum devoted to the cultural heritage of the Basque country. The museum occupies the Renaissance-era buildings of a 16th-century convent in the Old Town. Offering visitors an overview of Basque culture, the diverse collection is presented in different departments such as fine arts, history, archaeology, and ethnology. The fine arts collection exhibits a wide array of paintings, drawings, engravings, and sculptures. Among the highlights are paintings by El Greco, Alonso Cano, Rubens, Depièce, Morán, Ribera, and Coello. The Basque artists represented include Ugarte, Zubiaurre, Echagüe, Salaberría, Arteta, and Zuloaga. The archaeology department displays an extensive collection of coins, ceramics, and pre-Columbian artifacts, while the history department presents a unique exhibit on the history of weapons from the 15th century to the present day. The museum is open Tuesday-Sunday, with free admission on Tuesdays. 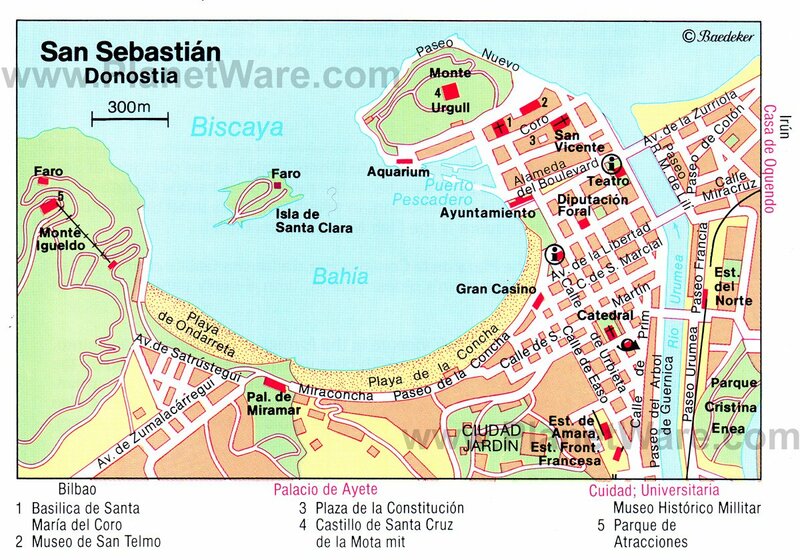 The historic Old Town of San Sebastian is north of the Alameda del Boulevard extending to Monte Urgull with the arcaded Plaza de la Constitución at its center. Many lovely balconied buildings line this square, which once staged bullfights. Notice the Neoclassical architecture of the municipal library. Near the Plaza de la Constitución is the Pescadería (Fish Market) and the 16th-century Iglesia de San Vicente. This Gothic church is San Sebastian's oldest church and has a richly carved retablo dating to 1584. A favorite pastime in the Old Town is strolling the quaint cobblestone streets in search of traditional Basque tapas. This atmospheric quarter is filled with authentic pintxo restaurants and is at its liveliest in the evening when tourists and locals flock to the area. Pintxos are delicious little snacks rather than a full meal, but are served in abundance with plenty of variety. Sample these tantalizing gastronomic delicacies, from deep-fried cod and marinated anchovies to crisp handmade croquettes. The experience is a Basque culinary adventure. This English Tudor-style palace was designed in 1888 by architect Selden Wornum of England but was completed by Benito Olasagasti. Surrounded by beautiful grounds overlooking the sea, the palace was built as a vacation home for the Spanish royal family. Several Spanish Queens favored this location for their summer holiday. The building is distinguished by its octagonal tower and half-timbered details. Notice the coat of arms of the Habsburg dynasty on the facade. The relatively simple but elegant home has two floors for the private residence and a third floor that was used by the servants. Beautifully manicured gardens with gorgeous ocean views lead down to a seafront promenade along the Bahía de la Concha. For stunning views of the San Sebastian scenery, head to Monte Igueldo. This steep mount lies just beyond the Playa de Ondarreta at the far end of the beach near the Royal Tennis Club. 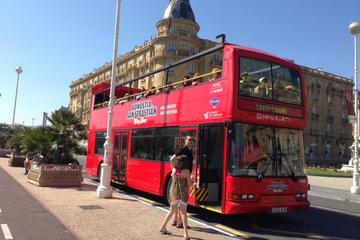 Tourists can take a funicular ride up to the top. The hilltop stands 184 meters above the sea, offering sensational panoramas. A favorite tourist attraction is the Parque de Atracciones de Monte Igueldo amusement park. Families with children will enjoy the charming carousels and roller coasters. Another highlight is the observatory with an outlook tower. Ascend the tower for magnificent views of the town, the Bay of Concha, and the rolling hills of the Basque countryside. At the Hotel Mercure Monte Igueldo, a stylish restaurant with an outdoor terrace is ideal for taking in the gorgeous scenery. Travelers can enjoy a delightful island getaway right in the city of San Sebastian. Declared a Historical National Interest Site, the Isla de Santa Clara is a tiny 30-meter-wide island just off the coast, combining the peacefulness of nature along with the amenities of civilization. The island has cafés, restaurants, picnic areas, and a post office. During summertime from June 1 to September 30, a ferry runs from the San Sebastian harbor to the island every 30 minutes. The island's small beach is surveyed by a lifeguard and is ideal for swimming. Hidden nooks along the island's coast offer natural swimming pools. Tourists can also go for a scenic stroll to the lighthouse and enjoy the stunning views along the way. This exquisite 18th-century Baroque church stands on the foot of Monte Urgull in the heart of the Old Town. One of the most-visited tourist sites in San Sebastian, the Basilica of Santa María del Coro was built on the site of an ancient Roman temple. The church has a splendid Churrigueresco facade with a statue of Saint Sebastian in a niche and two towers. Step inside to admire the interior, built on a rectangular plan with a semicircular apse. The sanctuary features impressive pillars and neo-Gothic vaulting. Guided tours of the Basilica are available. For tourists visiting San Sebastian at the end of July, the International Jazz Festival is a must-see cultural event. Concerts are performed at the Kursaal Centre along with seven other venues in the city. Devoted to high-caliber jazz and blues music, this top-notch festival presents a wide range of musical styles and genres. The festival takes place over six days with more than 60 performances. Concerts at the Kursaal Centre and Trinidad Square require tickets, while the concerts at the other venues such as Zurriola Beach and the terraces at the Kursaal Centre are free. Beginning at the aquarium, the Paseo Nuevo encircles the entire Monte Urgull, which is crowned by the Castillo de la Mota, a formidable 12th-century fortress, and a statue representing the Sacred Heart. The scenic promenade of Paseo Nuevo affords sensational views of the rocky shoreline extending to the Urumea River. Beyond the river's Puente Zurriola (bridge), a seafront promenade runs east towards Monte Ulía. Beyond the Zurriola Beach, the expansive Parque de Ulía is a beautiful natural space that's ideal for hiking and picnics. This well-known surfers' beach is in a commercial district of San Sebastian that has many sports shops, large department stores, and art galleries. The Playa de la Zurriola draws surfers from all over the world because of its challenging waves and surf competitions. This beach is also a favorite destination of sports enthusiasts, who come here to play beach volleyball, football, and beach tennis. San Sebastian's aquarium is fittingly located near the harbor at the end of the Bahía de la Concha. A popular tourist attraction, it is filled with colorful species from tropical fish to sharks. The aquarium also features an Oceanographic Museum with exhibits that display ship models, navigational instruments, and documents. A highlight of the museum is the Oceanarium, an underwater exhibition space. A walkway leads through a clear tunnel with 360-degree views of the swimming fish, sharks, and sea turtles in the aquarium. The 19th-century Aiete Palace of the Dukes of Bailen was built on a Camino de Santiago site where medieval pilgrims stopped on their way to Santiago de Compostela. The aristocratic palace once hosted illustrious visitors including Queen Victoria of England. Today, the palace grounds are used as a public park and venue for cultural events. This beautifully manicured parkland designed by French landscape architect Pierre Ducasse features a peaceful pond, caves, and rushing waterfalls. In an idyllic scene of pristine nature, hundreds of different trees and plants flourish. The park is a delightful place for tourists to explore on a sunny day, especially during spring and summer when the colorful flowers are in bloom. For those seeking another retreat in nature combined with gourmet cuisine, continue further afield to Akelarre Restaurant at 63 Paseo Padre Orcolaga (a short drive from Aiete Park). This top-rated gastronomic restaurant boasts three Michelin stars and stunning sea views from the dining room. A special menú degustación (tasting menu) allows guests to sample many different dishes featuring specialties of Basque cuisine. Gourmands will be interested to know that San Sebastian also has two other three-star Michelin restaurants, although the other two are on the outskirts of the city: Martin Barastegui Restaurant and Arzak Restaurant. The largest church in San Sebastian, the Cathedral of the Good Shepherd is in the New Town beyond the busy Calle de San Martín. This Neo-Gothic cathedral was designed by Basque architect Manuel de Echave in 1880 and completed in 1897. With its 75-meter-high tower, this inspiring edifice is an important city landmark. The cathedral was built out of sandstone from the Monte Igueldo. The immense structure covers an astounding surface area of 1,915 square meters. Visitors are awed by the spaciousness of the interior, which has a symmetrical Latin cross formation with three naves and a transept. The richly decorative sanctuary features stained-glass windows by Juan Bautista Lázaro, and the high altar displays statues of Nuestra Señora del Carmen (Virgin Mary), Saint Antonio, Saint Teresa, and the Sagrado Corazón (Sacred Heart). Luxury Hotels: Along the river in the old town and just around the corner from Calle 31 de Agosto, Hotel Maria Cristina is a grand hotel with impeccable service and an excellent restaurant. A 15-minute walk from the old town and 10 minutes from the galleries and shops in Gros, Hotel Villa Soro is in a distinguished old house, with free parking and bicycles. Hotel de Londres y de Inglaterra is a grand Belle Epoch hotel, with balconies overlooking the beach, only a few minutes from the old town. Mid-Range Hotels: Right on the beach promenade alongside the old town, old-fashioned Hotel Niza has balconies with sea views. On the hill just above Ondarreta beach near Miramar Palace, NH Collection San Sebastian Aranzazu has chic modern rooms and good bus connections to the old town. A 15-minute walk from the old town and beach, Hotel Astoria 7 has movie-themed rooms, on a street lined with shops and restaurants. Budget Hotels: Across the river, about a 15-minute walk from the old town, Hotel Record has free on-site parking. Hotel Zaragoza Plaza is one block from the beach and an easy walk to attractions, shopping, and the railway station. At the edge of the old town, just across the river from Zurriola Beach, family-run Parma Hotel has sea views. An easy 23-kilometer drive from San Sebastian, Hondarribia is a charming little fishing village and seaside holiday resort. The town is entered through the 15th-century Puerta de Santa María. Wandering the picturesque narrow streets of the old town leads to the discovery of many historic landmarks including houses with coats of arms on the facade. An important sight is the Iglesia de Nuestra Señora de la Asunción. In this Gothic church, the marriage of Louis XIV of France and the Infanta María Teresa of Spain was sanctified. For those who want to live like a king for a night, stay at the 10th- to 12th-century Palacio del Rey Carlos V, which has been converted to the luxurious Parador de Hondarribia hotel. For more beautiful coastal views, head to the Plaza de Armas that overlooks the mouth of the river and the lighthouse on Cabo Higuer to the north. Hondarribia is also known for its gastronomy and boasts two Michelin-starred restaurants, the Restaurante Alameda and the Maison Eguiazabal. This beautiful scenic driving route begins 25 kilometers outside of San Sebastian and less than three kilometers from Hondarribia. The road travels up the bare sandstone ridge of Jaizkibel to a height of 584 meters where the pilgrimage church of Nuestra Señora de Guadalupe stands. The Hotel Provincial de Jaizkibel offers quiet comfortable rooms and commanding views of the countryside. About 25 kilometers from San Sebastian, Getaria is a worthwhile excursion. On the way there, enjoy a lovely scenic drive. Beginning at Zarautz (22 kilometers away from San Sebastian), the magnificent road of the Cornisa Cantábrica (Cantabrian Corniche) extends along the rocky coastline. The fishing port of Getaria lies on a picturesque promontory with its harbor sheltered by the fortified island of San Antonio. The town's port is below the 13th-century Gothic Church of San Salvador and the waterfront of the harbor is lined with enticing seafood restaurants. Nestled in the Urola Valley about 40 kilometers from San Sebastian, the Monastery of San Ignacio de Loyola now houses a Jesuit college. The monastery was built between 1689 and 1888 based on the design of Carlo Fontana, a student of Bernini. The splendid Baroque church at the monastery features an impressive 65-meter-high dome by Joaquín de Churriguera and is considered one of the finest in Spain. The lavish sanctuary dazzles visitors with its overwhelming spaciousness and decorative marble inlays. A masterpiece of Baroque art, the high altar displays a statue of Saint Ignatius.